First of all I love LinkedIn. It is THE place to host your professional image for the world to see. It is, without a doubt, the top online resume platform. I also love that their revenue stream is more than just selling a glut of ads and promoted trends. Now with all the niceties out of the way, here’s why I think their new blocking feature is virtually useless. 1. People can still view your profile using the “Anonymous Viewing” feature. For example, if you decide to block me, I can just sign up with a different email, enable the “anonymous viewing” feature and start creeping. Granted, I won’t be able to get ALL of the information you have on your LinkedIn profile, but it would be a good start if I had nefarious intentions. 2. It won’t prevent those who you block from getting the information they are after. Let’s say you’ve blocked your old boss, for whatever reason, and she wants to find out where you now work. She can do any of these three things and find the information she is looking for in less than a minute. Go to LinkedIn, without logging in, and view your profile page. Or she can use the “Anonymous Viewing” feature. 3. 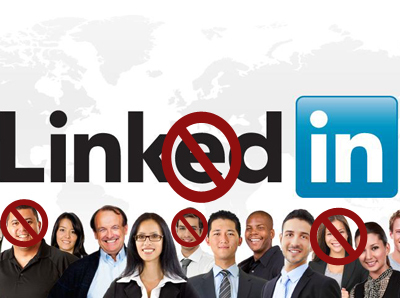 Why would you want to block anyone from seeing your LinkedIn profile in the first place? LinkedIn is a public exhibition of who you are from a professional perspective and it is just crawling with recruiters looking for their next hire. I use social media with this rule in mind – If I don’t want people knowing something about me, I don’t publish it on the internet. There is always a chance that your information, regardless of your privacy settings or who you block, friend, or follow, can be accessed by anyone with an internet connection. Blocking users you already know may be of benefit to some, but I think more LinkedIn users would be happy if the ability to view profiles anonymously was removed. If you are not convinced that LinkedIn blocking is virtually useless, and want to try it out for yourself, here’s a step-by-step guide to blocking and unblocking on LinkedIn…and be sure to let us know what you think of it, I’d love to hear your thoughts on the issue in the comments below.